31 mars 2011 par J.N. 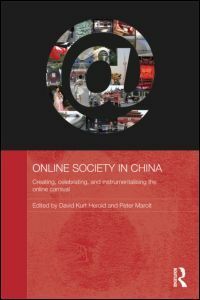 Creating, celebrating, and instrumentalising the online carnival, edited by David Kurt Herold, Peter Marolt, Routledge, 2011, 240 p.
This book discusses the rich and varied culture of China’s online society, and its impact on offline China. It argues that the internet in China is a separate ‘space’ in which individuals and institutions emerge and interact. While offline and online spaces are connected and influence each other, the Chinese internet is more than merely a technological or media extension of offline Chinese society. Instead of following existing studies by locating online China in offline society, the contributors in this book discuss the carnival of the Chinese internet on its own terms.